Hydrogen peroxide is the most common type of peroxide and many people have this solution in their homes. Hydrogen peroxide is scientifically known as H2O2 and can come in several forms. This mild antiseptic can be used to prevent infection from minor burns, scrapes, or cuts on the skin. You can also use it as a rinse for the mouth to remove mucus or take care of mild mouth irritation (such as gingivitis or cold sores). 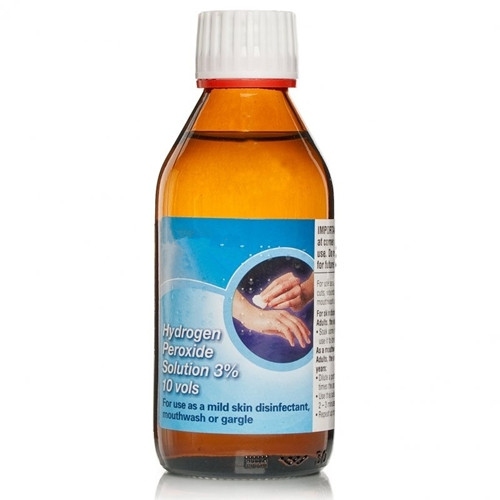 Hydrogen peroxide releases oxygen when applied to an affected area and this oxygen release leads to foaming which in turn removes dead skin while cleaning the area. As hydrogen peroxide has a long history of use, it has become a safe and well-known method to ease discomfort associated with ear infections or unblock ear wax. You can easily learn how to use peroxide in ear for removing wax or eliminating an infection. Combine the same amount of hydrogen peroxide and water in a cup, opting for hydrogen peroxide that is 3% or less. Take a cotton ball and soak it in the mixture. Tilt your ear up towards the sky with your head sideways. Use the soaked cotton ball to squeeze a bit of peroxide in ear (you will only need a few drops). Wait while gravity moves the peroxide through your ear wax and expect to feel a tingling sensation due to the bubbles. After a short amount of time, tilt your head back the other way so the solution can drain out. Never use objects to remove wax from your ears and this includes cotton swabs or hairpins. Doing so can give bacteria access to your ear canal or damage your eardrum. Anytime you notice changes to your hearing, see your doctor. Using the hydrogen peroxide ear cleaning method too frequently may lead to itching or dryness in your inner ear or bacterial infection. Be sure to keep your hands and fingers out of the ears at all times as the germs present may lead to infections. Never soak or dip contaminated cloths or other objects in the bottle of peroxide as this will contaminate the entire container. If it is contaminated, it will lose potency. Instead, pour out the solution as you use it and discard the used hydrogen peroxide afterwards. Most of the time, people will develop an ear infection following a cold due to the associated Eustachian tube swelling. Young children tend to develop ear infections more frequently because their Eustachian tubes are smaller, meaning they are more frequently blocked. You can use hydrogen peroxide in ears to treat infections related to the external ear. It works because the effervescence reaction will help loosen trapped particles in the ear, making them easier to remove and prevent infection. To use hydrogen peroxide to treat an ear infection, begin by placing two or three drops of the solution into your ear canal. Expect to feel a bubbly (or effervescing) sensation and you may notice a foam-like appearance. This is normal and you should let the bubbling stop by itself, which can take ten to fifteen minutes. When removing ear wax, tilt your head slowly in the other direction so the solution follows out. Wait one or two days and then pour a bit of warm water into your ear as this will extract accumulated dirt and wax. Moisten a cotton ball with rubbing alcohol and then use the cotton ball to squeeze a small quantity into your ear. Let this drain out and do not skip this step as it helps maintain a dry ear canal. When selecting your hydrogen peroxide, keep in mind that you should only use 3% strength or weaker for treating ear infections, removing wax, or general treatment of other wounds. Any solution stronger than this is not designed for medical use and instead is used for industries. Most experts consider it safe to treat the occasional external ear infection by using hydrogen peroxide. Despite this, you should never use it if your eardrum is punctured as this may lead to ear pain or in severe cases, mastoiditis, which occurs when the peroxide reaches the middle ear and mastoid cavity. In addition, you should not use peroxide to treat inner ear infections, particularly in cases when the infection is in close proximity to the eardrum as this may lead to deafness.